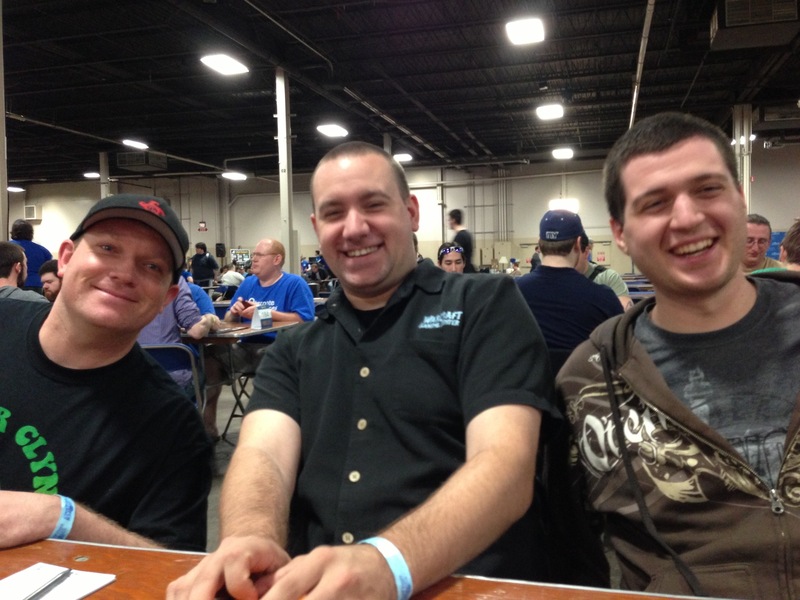 Last Sunday I got up way too early and met up with Matt Jones and Kadar Brock at the Official Williamsburg Meeting-Place for Magic-Related Travel—aka Kellogg’s Diner—to hit the Star City Games team sealed event out in Somerset, NJ. 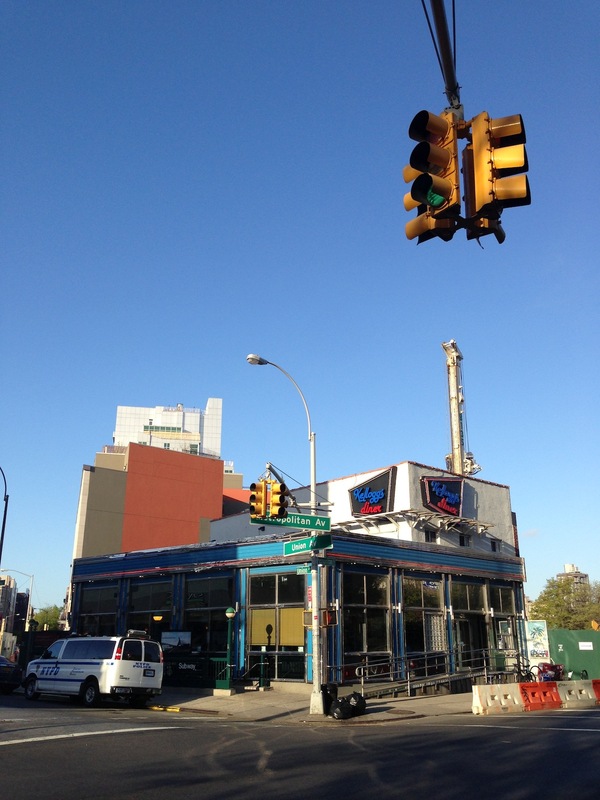 We’d practiced a little bit for the tourney, including a full-block sealed practice the Thursday prior, at Fat Cat in Manhattan’s West Village—but, given that both team sealed and Dragon’s Maze are new formats, I wasn’t as confident about my level of preparation as I usually like to be. This photo—and virtually all of the others in this post—courtesy Matt Jones. Nevertheless, we’d prepared as much as we could, and I knew it would be fun. We got out there within an hour or so, Matt Jones telling me along the way that I was “like a pushy therapist,” which made me laugh out loud, and confirmed our preregistration, switching the team up so that I would be in the middle, as Player B, with Kadar (Player A) on my left and Jones (Player C) on my right. Somewhere along the line I seem to have been designated team captain and resident Limited expert, which, hey—I’ll take it, but I’m not entirely sure I deserve it, as Kadar and Jones are both very talented players. Me and Ol’ Lightbuoy Kadar looking like some double-hard bastards. After watching a bit of the previous day’s Standard Open top 4, featuring Owen Turtenwald and some other guys I didn’t recognize, we caught up with some fellow 20-Siders and got seated for the main event. We noticed that some teams, at the six-person tables, were seating themselves in an “L” configuration, with one guy across from you and the other to your right (or left, as the case may be). Our team elected for the all-in-a-row setup, which I think is preferable. 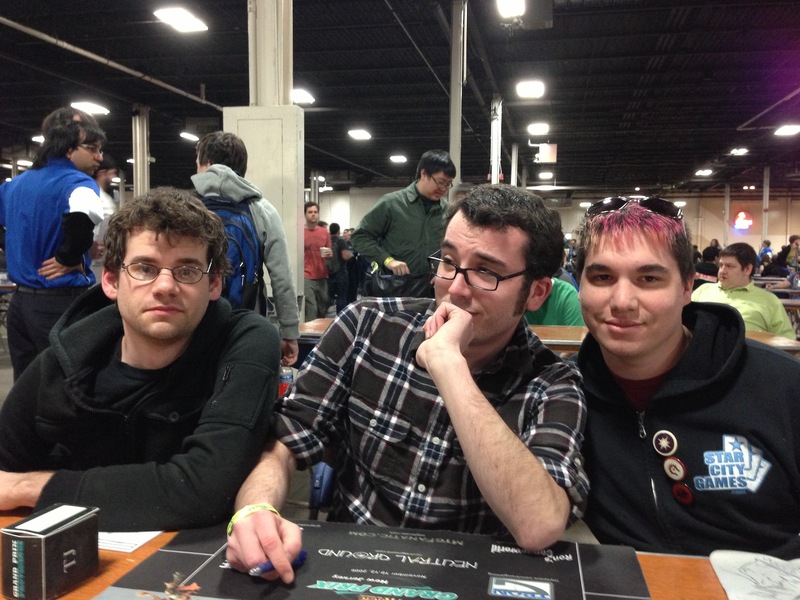 The team across from us, which included SCG writer Brian Braun-Duin, aka BBD, was short one person—because he (Chris VanMeter, also an SCG writer) was playing in the finals against Turtenwald, and eventually won. Nice one, man! 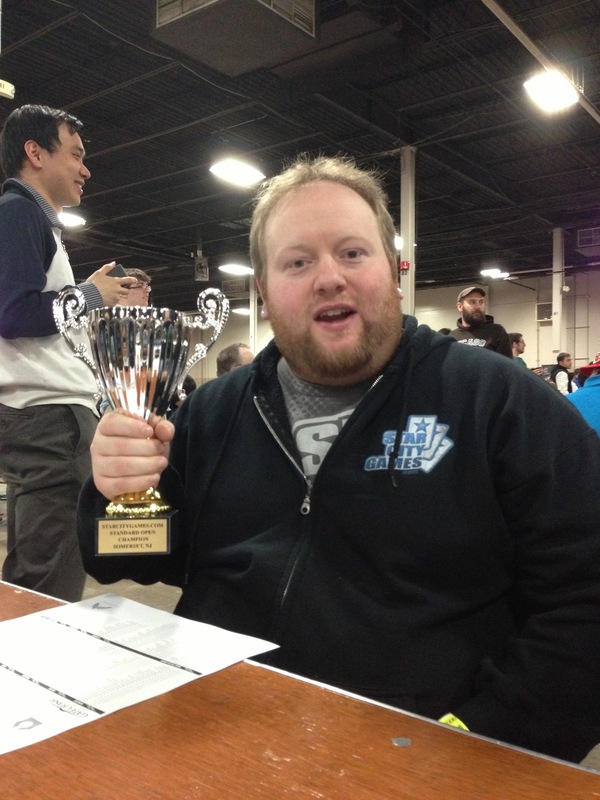 Chris VanMeter, SCG Standard Open winner! 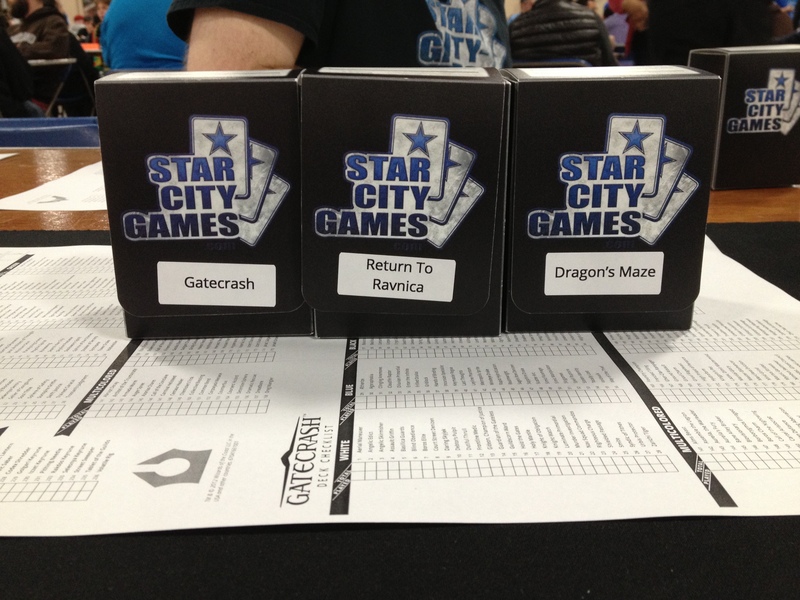 Soon we were passed deck boxes containing four packs each of Return to Ravnica, Gatecrash, and Dragon’s Maze by the strangely (I don’t do too many SCG events) blue-and-white-shirted judges, and got to sorting and registering the pools. Then, after a fairly elementary pass-the-pools situation—pass across and pass behind, and that was it, if memory serves—and being informed that, with [I forget how many] teams, the day would consist of nine rounds of Swiss before a cut to top 4, we got started on our hour of deckbuilding. I had been obsessing somewhat about having enough time to build and register such as unwieldy pool—and I’m glad we’d practiced it once prior, at Fat Cat, as this was the most unfamiliar and challenging part of the day. What made it worse was that, after we’d sorted out our three decks, we then had to split up the remaining cards into three sideboards, and then register all 172 of the cards (plus basic lands) across three 11×17 decklists—which were, to further complicate things, split up into RTR, GTC, and DGM on the sheet, so that you had to keep flipping the page back and forth to mark the cards. You see that sheet under the boxes? That’s the 11×17 deck-reg sheet. Crazy big. Long story short: At GP Providence, and any future team sealed events, be sure to give yourself enough time (maybe 20 minutes, no kidding) to register and double-check your pool. It seems like it would be really easy to make a mistake, given the unfamiliar (and uneven, across the three decks + sideboards) number of cards, which could potentially lead to a deck-reg-error game loss for your team, and nobody wants that. And here is some super-mandarin-level tech: While a “typical” team sealed pool would be 168 cards (12 packs x 14 cards per pack), an RTR block team sealed pool is 172 cards, because of guildgates (and shocklands and Maze’s End, to a lesser extent) replacing basic lands in the four Dragon’s Maze packs. I realize now that this is why I was getting what seemed like a bad number (172) when I was adding up the number of cards my teammates and I had registered, as time in deck construction was running out. But I’m getting ahead of myself. Our pool seemed strong, with a ton of massive BW bombs—Teysa, Envoy of Ghosts; Obzedat, Ghost Council; and Deathpact Angel—as well as great RB cards like Exava, Rakdos Blood Witch and Sire of Insanity. We also had a Loxodon Smiter, making Matt Jones a very happy man. I happen to be a big BW fan, so I gravitated toward building that deck, while we put Matt Jones on Bant and Kadar on Rakdos. Unfortunately our fixing was kind of at cross purposes with our bombs—lots of Simic and Dimir guildgates, keyrunes, and cluestones, but zero Selesnya or Golgari, the latter of which required us to keep Varolz, the Scar-Striped on the bench—but them’s the breaks. On the whole, I was happy with our decks. I ended up going straight BW, with a single Orzhov cluestone (out of two) strictly for ramping purposes, while Kadar splashed for Warleader’s Helix, off of a fortunate two or three Boros Guildgates. Matt had an Urban Evolution, an Unflinching Courage, and a Krasis Incubation, which is, of course, a UG Arrest. Although I would have killed for a Basilica Guards, my early game and removal situation was decent as well, with a pair of Basilica Screechers, a white Arrest, a Fatal Fumes, and an Angelic Edict. And then of course I had my late-game mega-bombs. For our first match of the day we got paired against three happy guys—everyone we played against seemed like they were having a really good time, and we were too; maybe team events filter out those lumpen proles who struggle even to grunt at you in acknowledgement?—and, after Matt Jones took a team photo of them for “the nerd blog we write for,” the clock clicked down from 50 minutes and we started playing. These guys were pretty dope, as you can see. A quick word on consultation between teammates during the match: We generally consulted each other on our mulligan decisions, and Kadar occasionally put a question to me during his match—but otherwise we kind of kept to ourselves and played our own games, which probably is how you ought to do it. Anything further, like when the middle guy tries to direct the plays of his teammates on either side of him, and you run the risk of slowing down the games considerably. Case in point was my R1, a super-grindy match vs. GW. I won G1 and had a sick hand (Obzedat and Deathpact) to start G2, but got stuck on four lands forever and couldn’t capitalize on my strong opening draw. Meanwhile, when I finally was able to play Obzedat, he had Turn//Burn for it after a couple of turns, and then Fall of the Gavel (!) to answer Teysa. I stuck Deathpact but had to keep chumping his Steeple Rocs with it. Eventually I got down Azar’s Elocuters and was on that plan (with Kadar advising, as he’d won his match by this point) because of a massive board stall, and it was working—but then he drew a card and said to himself, “Well, that’s one way to do it,” and promptly Teleportaled me for 28 damage and the win. OK. We started G3 basically as time ran out, and ended up drawing the match. Matt Jones, meanwhile, was also on turns, but was much further along in his game. Here KB and I were actively advising Matt, and on T4—Matt’s last turn—we were puzzling over how we could possibly get the win and, thus, win the match. Basically we couldn’t do it, though, despite a Giant Growth in hand, and had to just swing in to see if our opponent messed up, and he didn’t. So Matt shipped the turn back, his opp. couldn’t win, and that match was also a draw. 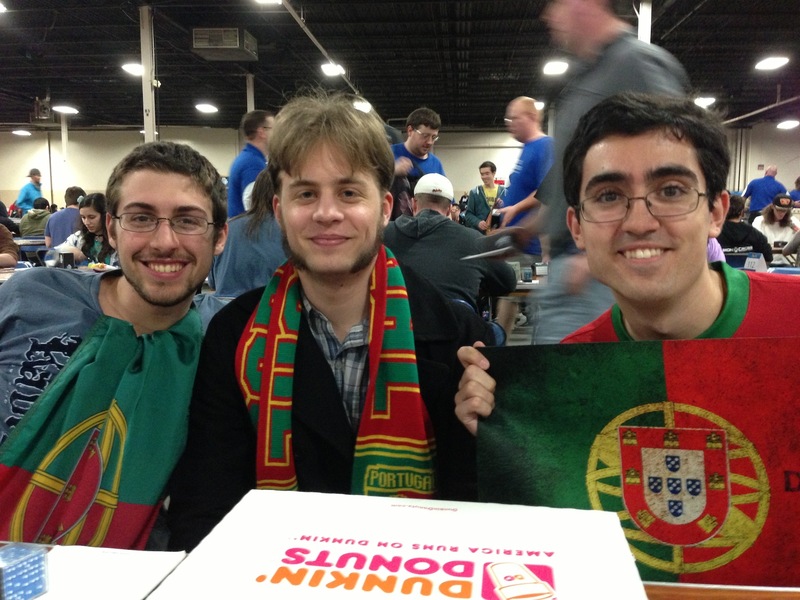 Team Portugal. That’s Dave (the only Portuguese dude on the team) on the right. He even asked me and Matt Jones to autograph our Hipsters business card for him after the match was over! Like I said, it just seemed like everyone was having a really good time. Team events are dope. With that we decided to call it a day, in order to spend some time with the girlfriends (or the Knicks, in Kadar’s case) and have a proper Sunday evening. 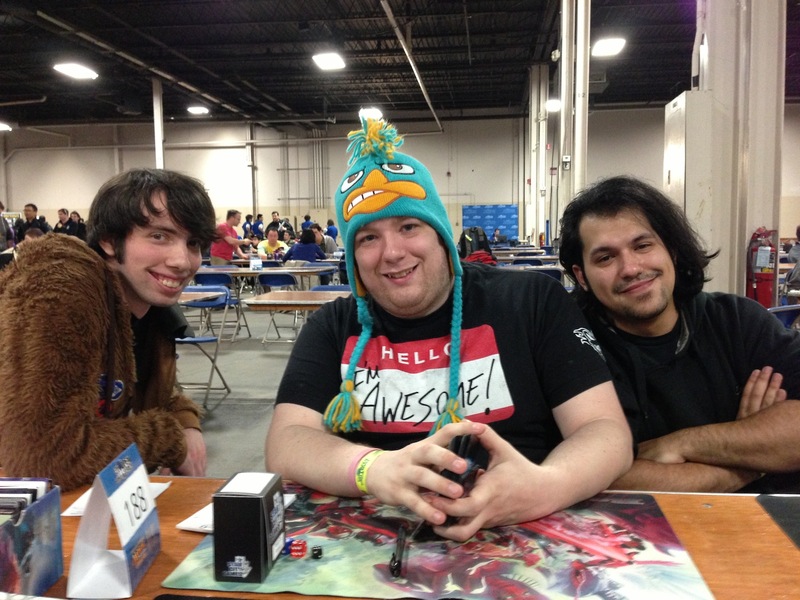 The matches and playing alongside KB and Matt were really fun, and I would have been happy to stay and play it out had this been a GP day one. As it was, though, it just wasn’t worth it to us to grind it out. I also learned that Matt Jones had 750+ Planeswalker Points from last season, and so we are good to go for one bye at Providence; all this time I’d been operating under the assumption that one of us needed to break 750 points this season in order to have the team-GP bye. WRONG AGAIN, ROLEX. The value of “wrong again, Rolex” is actually unquantifiable in my mind. Those team pictures are awesome.